PLAY THERAPY IS A VERY EFFECTIVE WAY OF HELPING CHILDREN WORK OUT EMOTIONAL CONFLICTS AS PLAY IS A UNIVERSAL NATURAL LANGUAGE FOR CHILDREN. identifications with the play characters enable the child both to identify his difficulties and find resolutions. The skilled practitioner helps the child in this process. 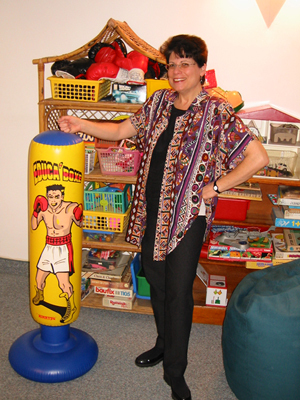 Since 1985 I have studied the field of family play therapy with Dr. Shlomo Ariel, world reknowned in this field. Under his supervision my family therapy cases were analyzed with him in his clinic. Dr. Ariel's recently published book, Strategic Family Play Therapy, (Wiley Publishers, Great Britain) contains many examples of techniques that were taken from cases which we treated together. I am acknowledged in the book as a contributor.